My close friends and family can tell you that one of my biggest fears of homeschooling was not finding families that we identified with. I feared a big “dating game” of trying people on and then having that awkward conversation about how things weren’t working out. I was not looking forward to this. I belong to a Homeschoolers Message Board for this area and on this board they are always posting classes, events and groups that are starting up for homeschoolers in our state. I have been apart of this community for about a year (loved seeing what was available) but hadn’t signed up for anything because Z was in school. In August I started paying closer attention to the groups forming and when “Waldorf C0-op” surfaced, I was interested. I have read many books about Waldorf education and if there was a school closer to us, that may have been our path over Montessori. I do love Montessori but there is something about Waldorf that calls to me. This being said, I would not consider us Waldorf or Montessori homeschoolers, our homeschool is a modge-podge of methods and ideas that work for us. Despite not being devoted to Waldorf, I had a feeling that the families interested in this co-op would be families that I could identify with and would want my children surrounded by. After our first meeting with this group, I knew it was going to be something special. The families are so kind and come from many different philosophies of education. Everyone is so respectful and we have a lot of exciting things planned for the children this fall. The children range in age from 2-9 and so we have split them into two classes. 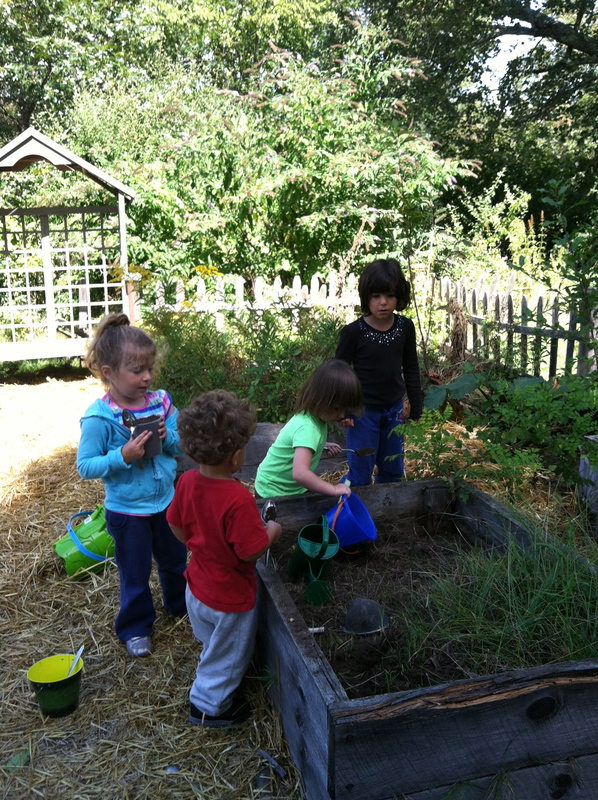 The “Littles” participate in gardening, nature walks, Circle Time, play, rest and snack. The co-op takes place on the beautiful farm of one of the members and it is such a lovely space for them to play and enjoy time together. The older children have art each time we meet (we meet weekly) and this month are focusing on animal habitats, tracking, outdoor cooking and outdoor survival. One of the fathers has been teaching these outdoor classes and it has been so much fun for me to learn right along side them. Next month the children will put on a Halloween play, in November they will study Native Americans and in December I will lead them through the month of Advent. Slowly the children are starting to get to know one another and the adults are doing the same. It is a nice little community that we are building and I am so grateful for these new friends in our lives.